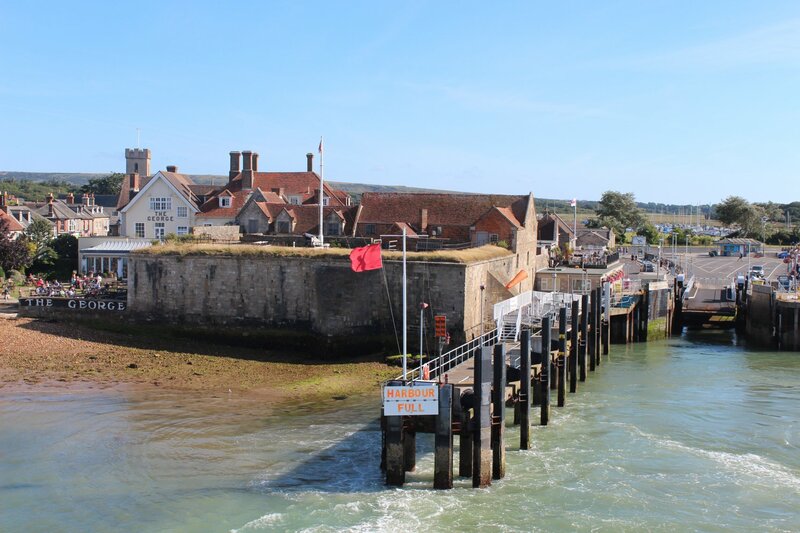 In the afternoon we made a little side-trip to the Isle of Wight, a short hop by ferry from Lymington, to see another of the coastal strongholds that Henry VIII commissioned to defend the entrance to the Western Solent – Yarmouth Castle. 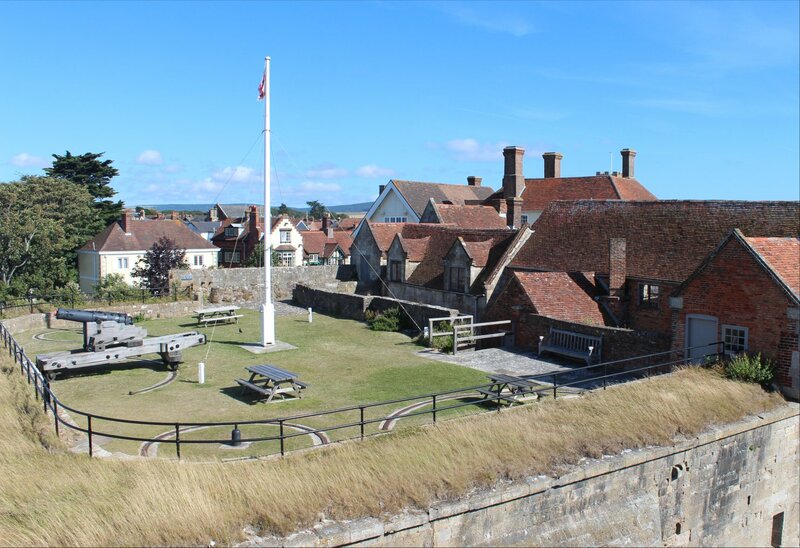 The construction of Yarmouth Castle was prompted by the urgent need to address the vulnerability of the Isle of Wight and the Solent following an unsuccessful French invasion in July 1545. Francis I had assembled an armada of 200 ships and 30,000 soldiers to attempt an invasion of England, resulting in troops landing on the Isle of Wight. 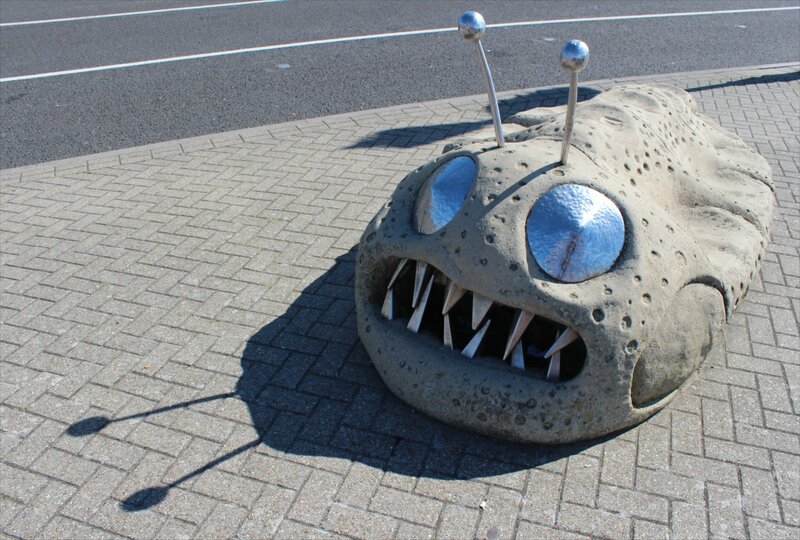 To put this into some context, this was a force twice the size of the Spanish Armada that threatened England later in the century. Ultimately, the French troops were repelled by the local militia and the armada was unable to secure sufficient advantage to make it worth continuing the battle. The ambigious nature of the conclusion to the ‘Battle of the Solent’ probably goes a long way towards explaining why it is not well remembered today. Not a glorious victory, nor a terrible defeat. 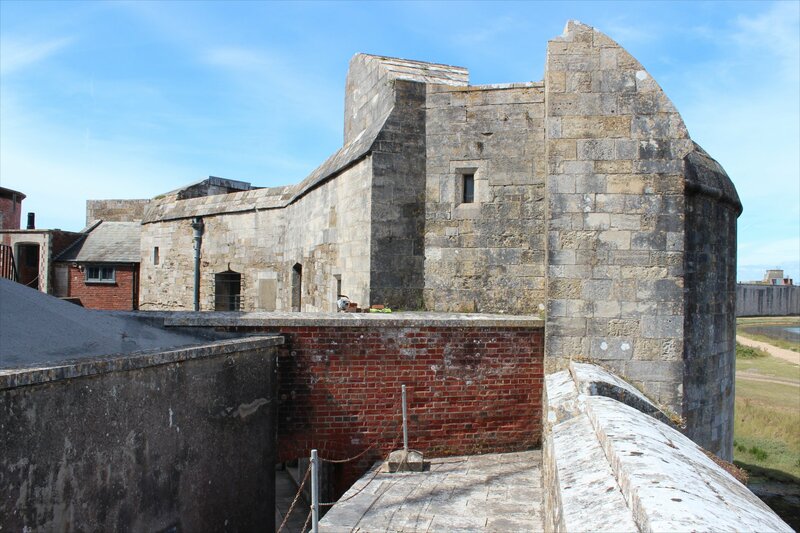 The castle was operational by September 1547 so is contemporaneous with Hurst Castle, but built to a radically different design. 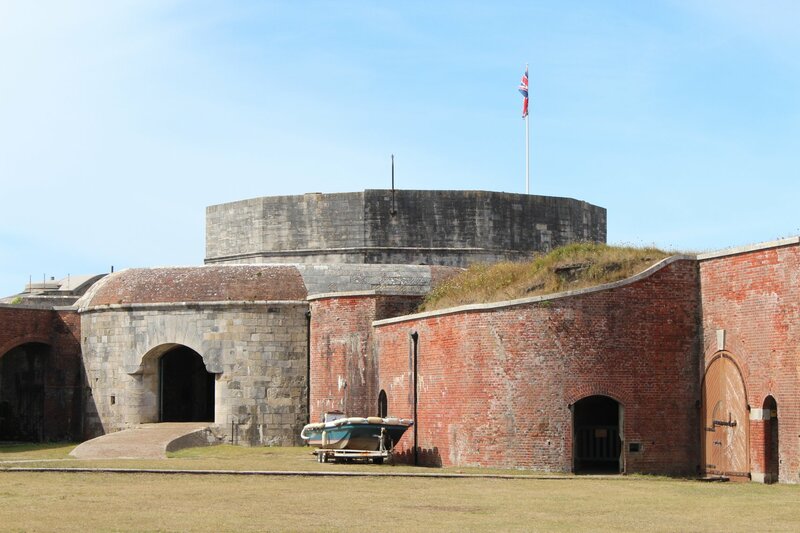 The construction at Yarmouth was influenced by the latest trends in continental castle design – out went rounded bastions and in came arrow-headed bastions. However, completion of the original design for the castle had been abandoned by the late 16th century. The outer walls were lowered and half of the castle’s courtyard was filled in with rubble to produce an artillery platform. As an added benefit, the platform would have softened the impact of any enemy fire directed at the castle. 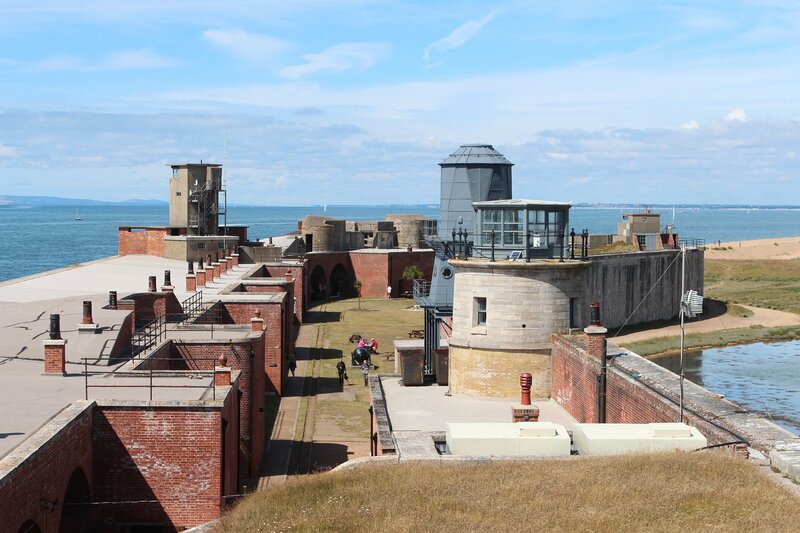 Although the castle has seen various changes since then, it hasn’t witnessed the degree of modification in the nineteenth and twentieth centuries that other coastal fortresses have seen (such as at Landguard Fort and Hurst Castle). The square fortress that has survived to the present day would still be recognisable to its builders, even if half of the interior has been buried! Our exploration of the castle took only half an hour, but the information on display did a terrific job of telling its story (much better than many castles do with hundreds of display boards). The guide book they sell on site is pretty decent too. 1. The disused railway station, now wonderfully reconstructed as the Southern Railways themed cafe/restaurant Off the Rails and a great spot for an ice cream on a hot summer’s day. 2. Saint James’ Church with its supposedly ugly tower. 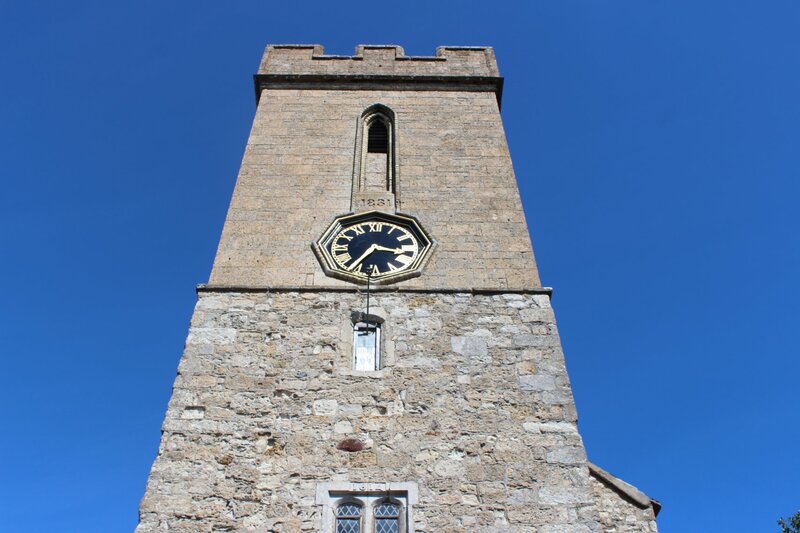 The tower (1831) was designed by Daniel Alexander, an architect better known for warehouses, lighthouses and the original Dartmoor Prison. The incumbent vicar at the time thought this portfolio of work was telling! 3. 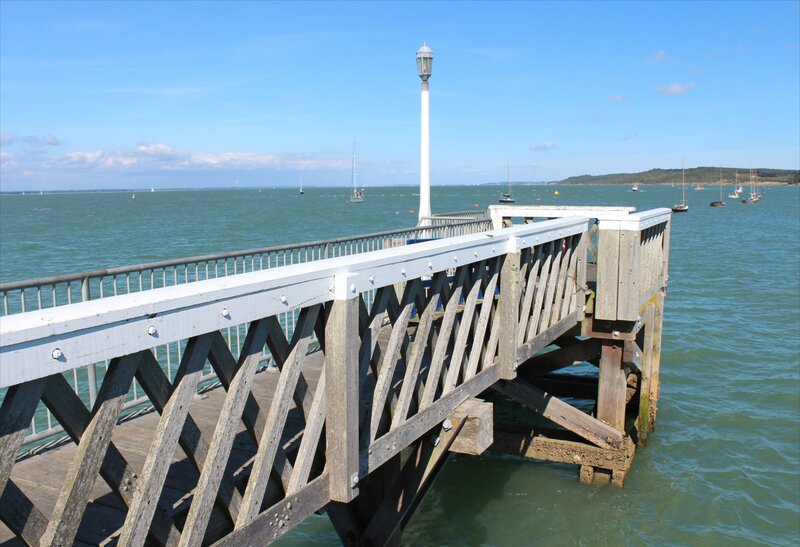 Yarmouth Pier, which is the last operational all wood pier in the country, originally constructed in 1876 to service London and South Western Railway Company steamers. As the wooden piles only last 15-20 years it is essentially undergoing constant restoration. 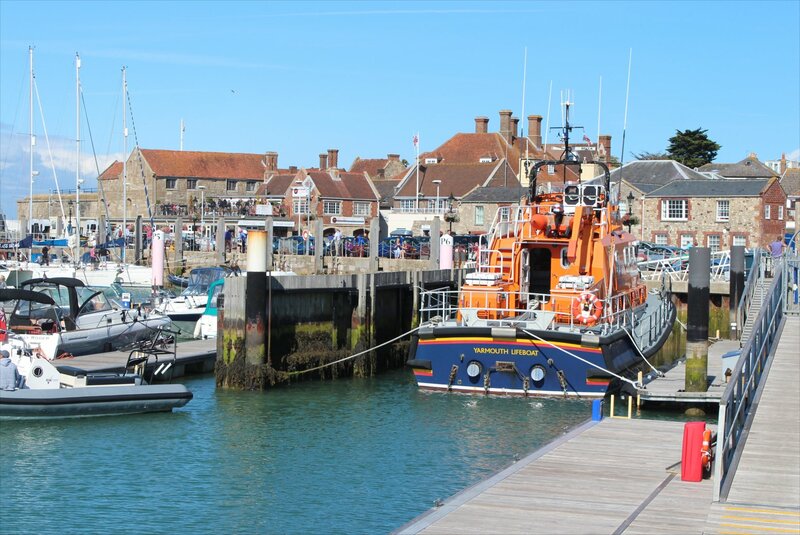 Our afternoon visit to Yarmouth concluded around two hours after we arrived. 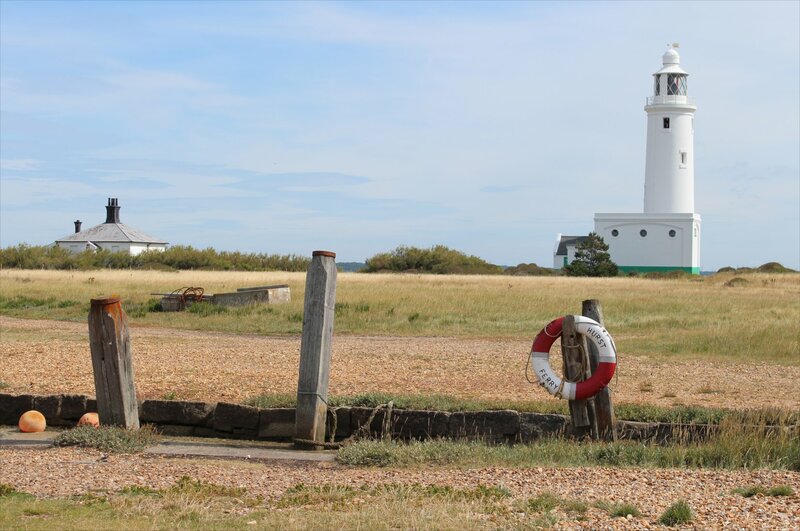 We had originally hoped to spend more time on the island and visit the Needles and the nearby old and new batteries, but circumstances dictated a shorter stay. 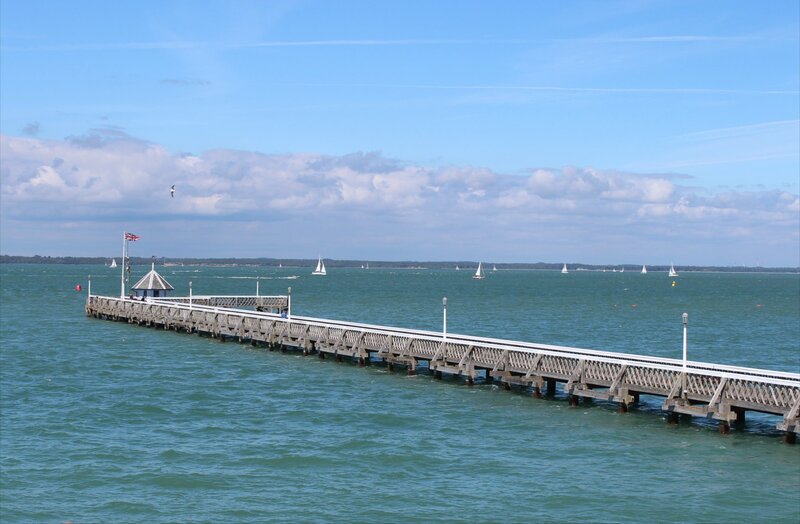 I’m sure we will be back to take a look at those places on some future occasion – the Solent seems to hold quite a lure for us. 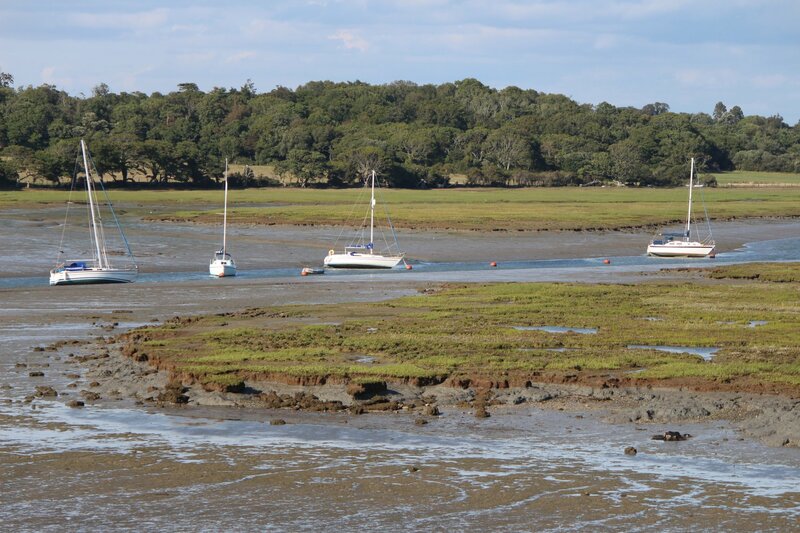 The day ended with a return ferry to Lymington at a particularly low tide, which meant our ship had to proceed down the Lymington river at a slower pace than usual. No complaints from me – it’s a lovely stretch of coastline to admire and photograph (excessively as usual). Meanwhile, my ferry-phobic travelling companion had to admit that the crossing was not as bad as expected. One step closer to a world cruise..!? A day return foot crossing by ferry cost us £14.20 each. Advance booking is recommended to guarantee the crossing you want (we discovered that we couldn’t get a walk up ticket for the crossing we wanted, but were lucky enough to be able to get on in the end). 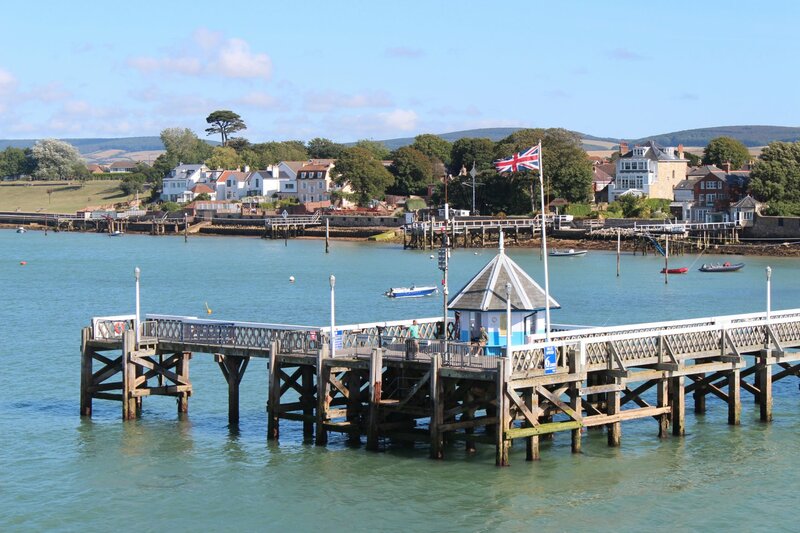 The terminal at Lymington Pier is a short hop by train from Lymington Town station (or a twenty minute walk), whereas the terminal at Yarmouth is in the centre of town and right next door to the castle. 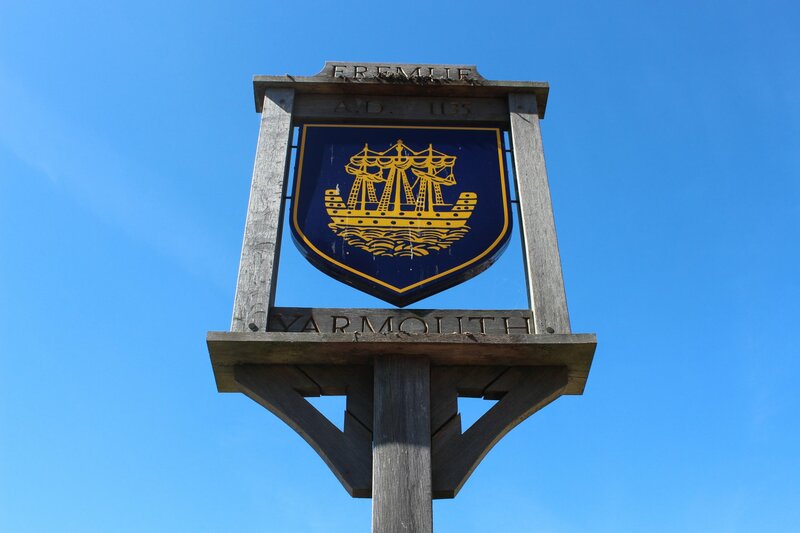 Admission to Yarmouth castle currently costs £5 for adults (free to English Heritage members) and opening hours when we visited were 10am to 4pm (the castle is closed in winter). On our return to Lymington we found a wonderful pub for dinner, The Ship Inn, located on the waterfront. The pub served up a fine combination of real ale and some tasty dishes with a twist (the damson plum & apple shortbread crumble served in the pan comes highly recommended). This weekend’s escape has brought us to Lymington, a charming Georgian market town, which looks as though it has a larger population of yachts than it does houses. It’s a lovely place to stay (we opted for the delightful Angel and Blue Pig) with a pretty impressive selection of places to eat and drink. 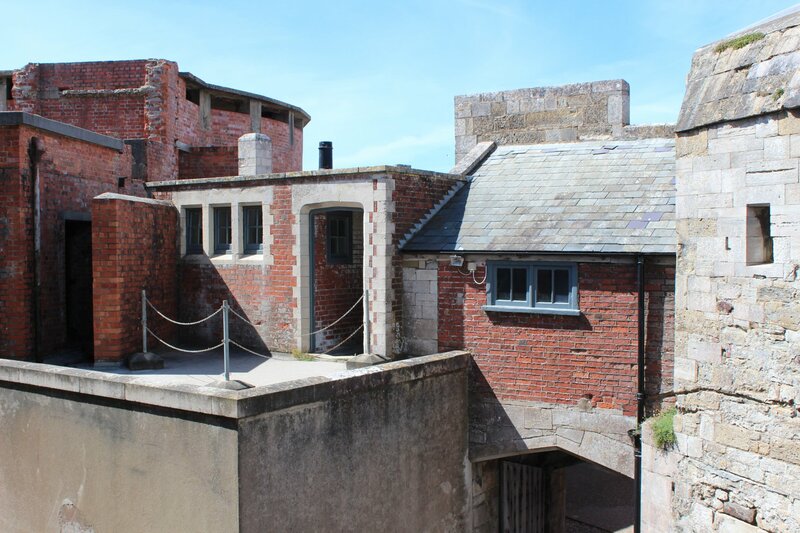 However, pretty as this place might be, it was just a springboard for a visit to an even more remarkable place – Hurst Castle. 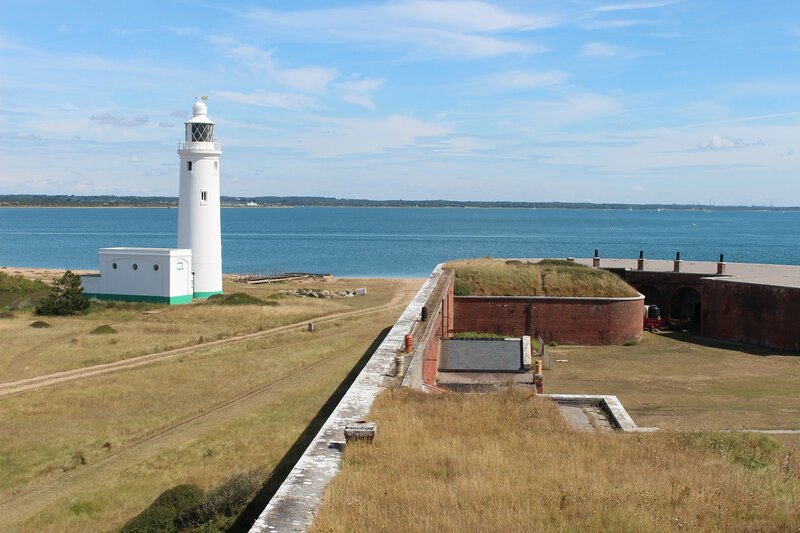 Hurst Castle is located in almost splendid isolation at the end of a one and half mile long curving shingle spit and has been protecting the entrance to the Western Solent since the 1540s, guarding the approach to the strategically important ports of Portsmouth and Southampton. 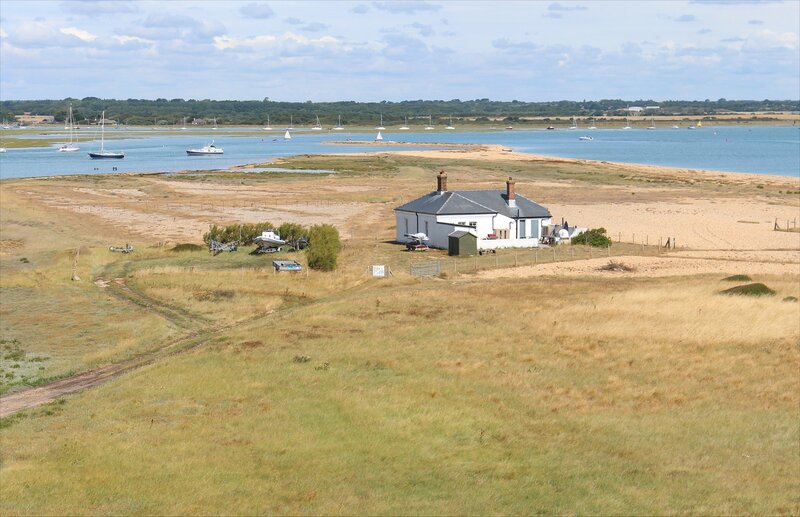 The only other buildings in the vicinity of Hurst Point today are the High Light (1867), the Lighthouse keeper’s cottage and the former Commanding Officer’s House. 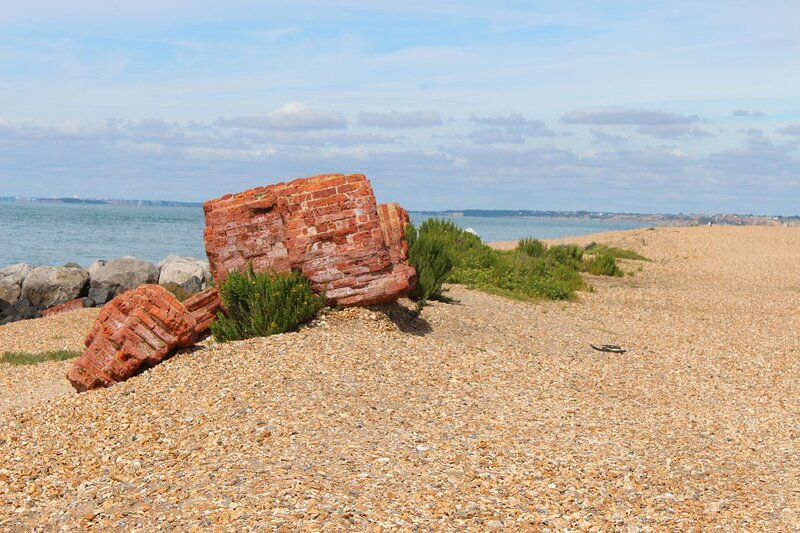 The isolated location is part of the appeal – the only way you can reach the castle is by walking along the spit from Milford-on-Sea (a steady walk of around 30 minutes) or by taking the ferry from Keyhaven. The precarious nature of the place is reflected in the failed attempt to connect the castle to the water mains in 1942 which came a cropper when the shingle shifted (to this day supplies of drinking water are ferried to the castle). 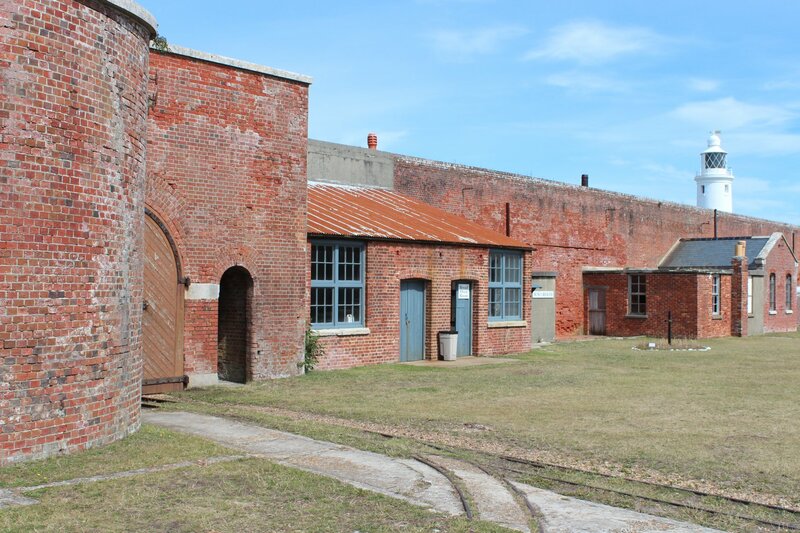 Nevertheless, in spite of all the complications of life at such an exposed location it was home to a small community of mariners and fishermen in the mid-nineteenth century, with the population reaching a high of 163 in 1861. Over time the small collection of buildings, which included an inn and a schoolhouse, have disappeared and the last inhabitants had left by the 1980s. 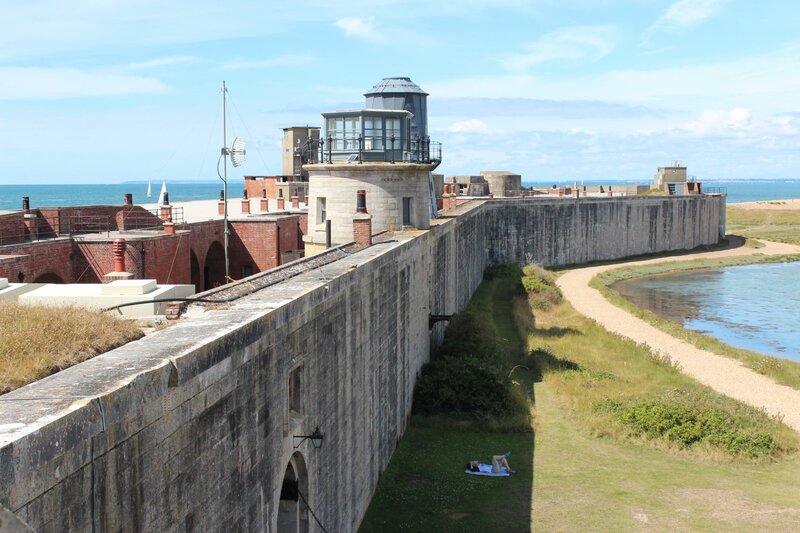 Hurst Castle’s most famous resident (albeit an involuntary one) was Charles I, who stayed at the fort for nineteen days in the winter of 1648 on his journey from the confines of Carisbrooke Castle to trial at Westminster Hall in London. The castle and its surroundings did not make a favourable impression on the king’s servant, who described it as a ‘wretched place’ with rooms that daylight rarely penetrated. 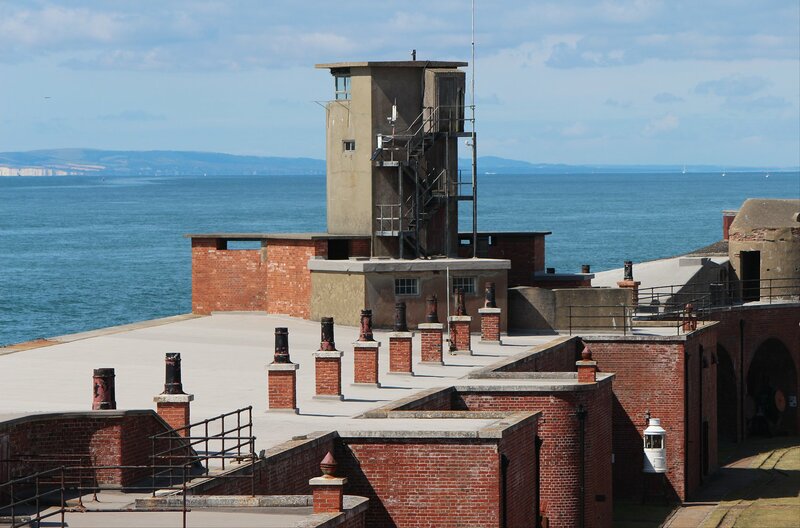 Although a prisoner, the king was allowed to walk along the spit for his daily exercise which must have been welcome respite from his gloomy chambers in the keep. The most impressive views of Hurst Castle come from the air, as this makes the unusually elongated footprint of the castle walls most apparent. Be in no doubt, this is a castle shaped around function with two lozenge shaped wings of armoured batteries extending on either side of the Tudor fort. 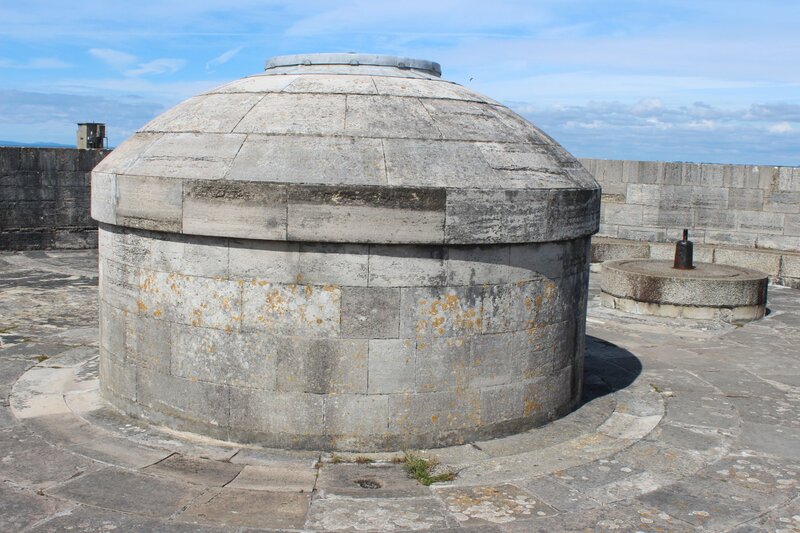 The two wings housed 41 huge guns in their casemates, providing a formidable challenge for any invasion fleet irrespective of their slow loading nature (only one shot could be fired from each gun every 2.5 minutes). 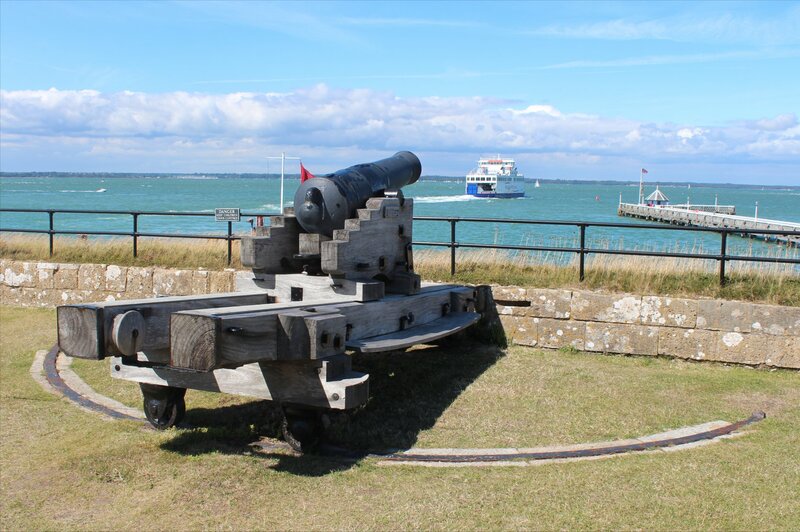 To get the shells into the magazines, located at the far end of each wing, a narrow gauge railway was constructed from the military jetty into the castle. Tracks ran the entire length of the castle but avoided the Tudor Fort at the centre, instead running out of the gateway to each wing to connect with the track outside of the castle walls. Much of the eighteen inch track remains today, as can be seen on the ground floor plan provided by English Heritage. The line appears to have been hand-worked, rather than using locomotives. 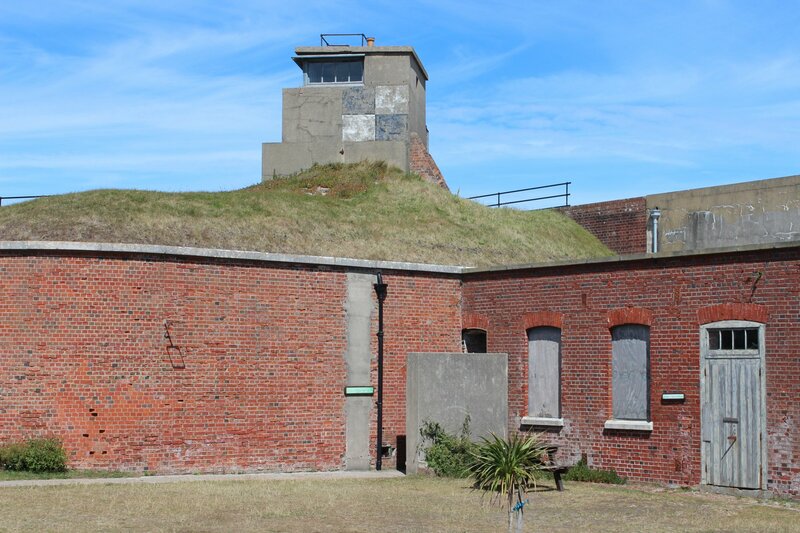 As you might expect, the fort was adapted in both the First and Second World Wars. 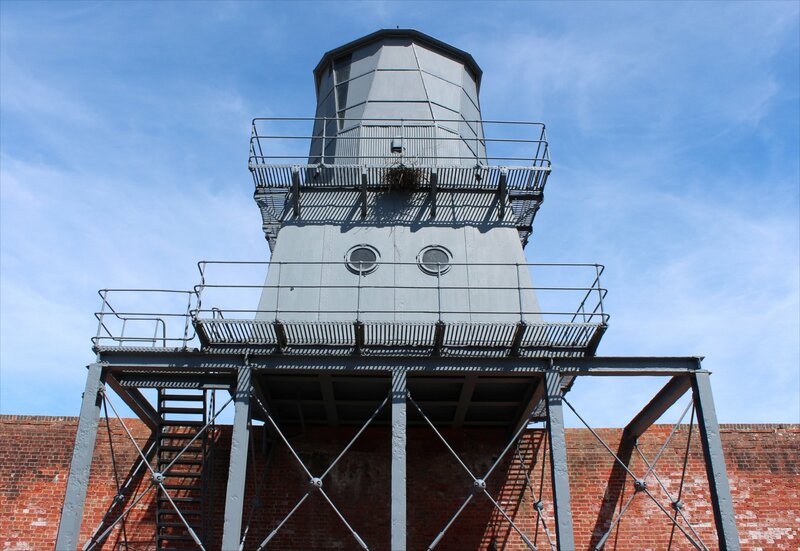 The latter saw the installation of two Director towers and a series of searchlights. One of the director towers remains to this day, providing a complete four hundred year span in the evolution of the fortifications on view. 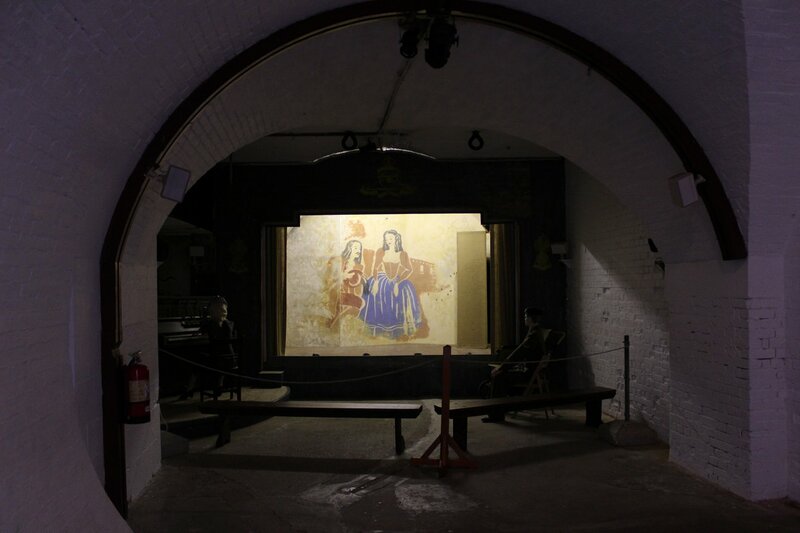 One of the more unusual features in the castle is the Garrison Theatre created in the casemates during the Second World War, including painted background scenery and a proscenium arch made from pine, chipboard and metal. It is reckoned to tbe the last example from the war to have survived. 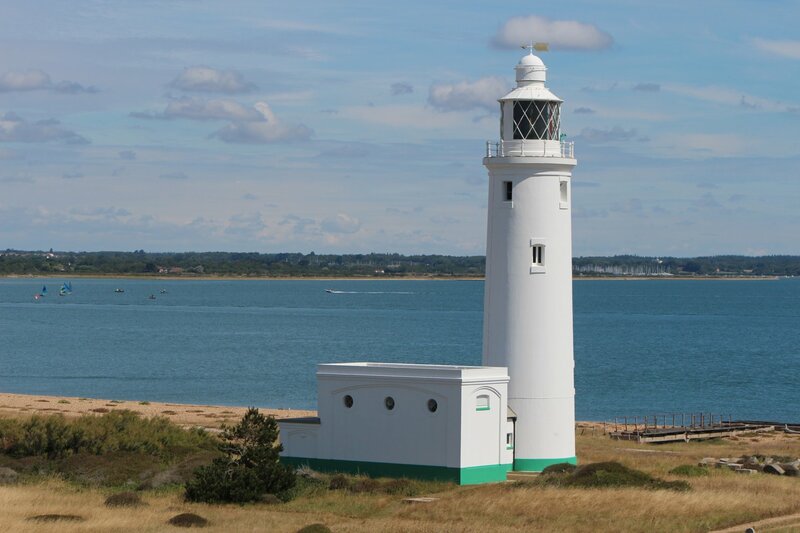 The first lighthouse was constructed at Hurst Point in 1786 and three can be seen today, though only one is operational – the twenty-six metre tall ‘High Light‘ constructed in 1867. 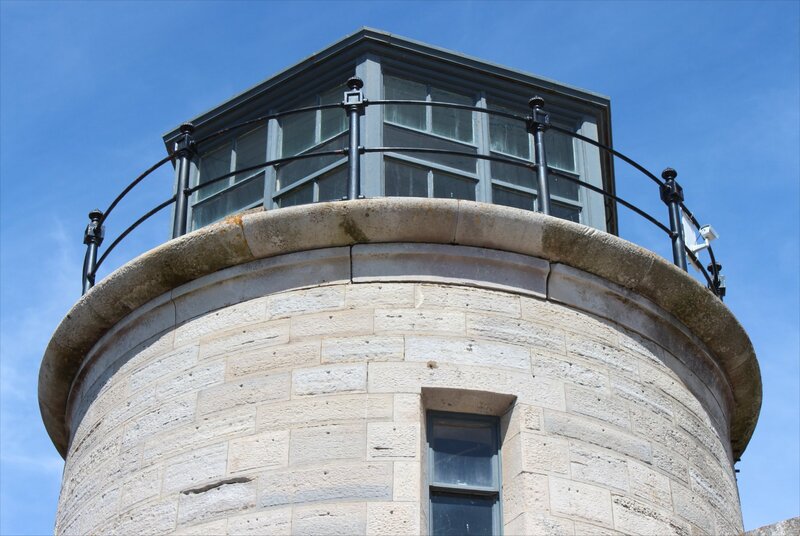 The two decommissioned lighthouses can be seen inside the castle – a stone built low light from 1860 and its successor, a metal low light built in 1911. 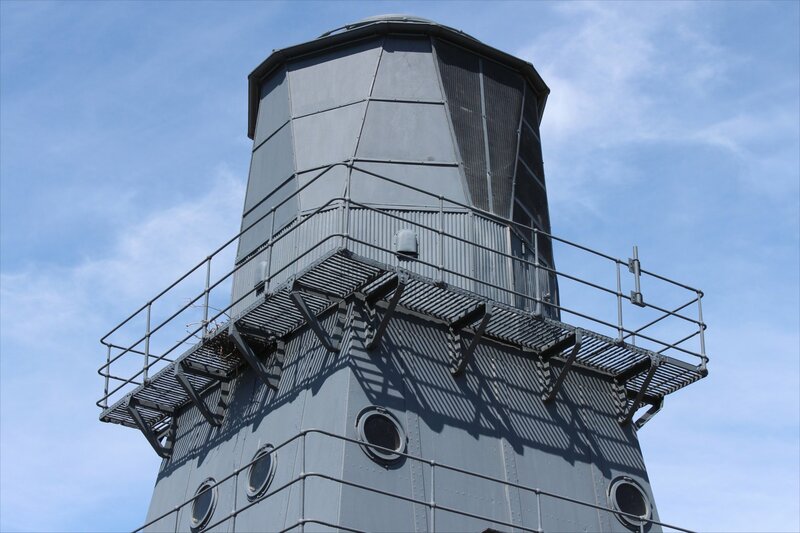 Both of the low lighthouses are painted grey to avoid any navigational confusion. Appropriately, the castle houses the museum of the Association of Lighthouse Keepers. 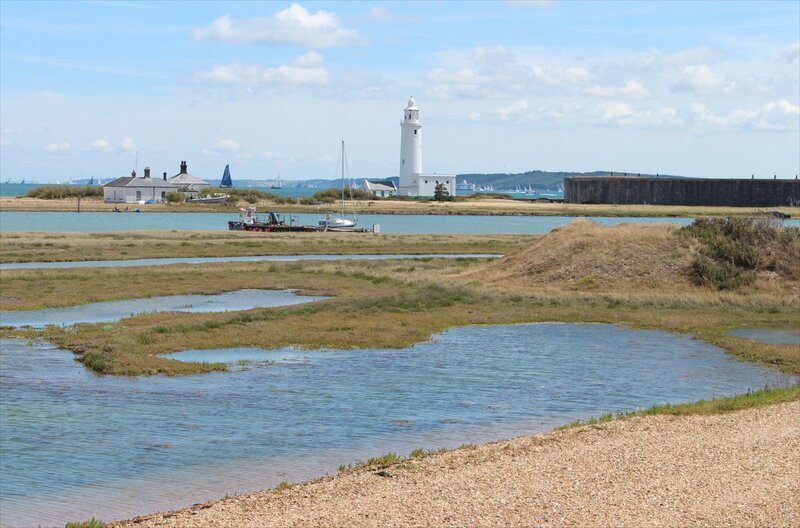 The biggest challenge to the castle today comes from the forces of nature – an unintended consequence of the coastal protection works further along the coast which robbed the spit of its natural source for shingle replenishment. Studies concluded that without human intervention it was possible that the spit would be breached and the castle marooned on an island, whilst the salt marshes beyond would be left exposed to destruction. 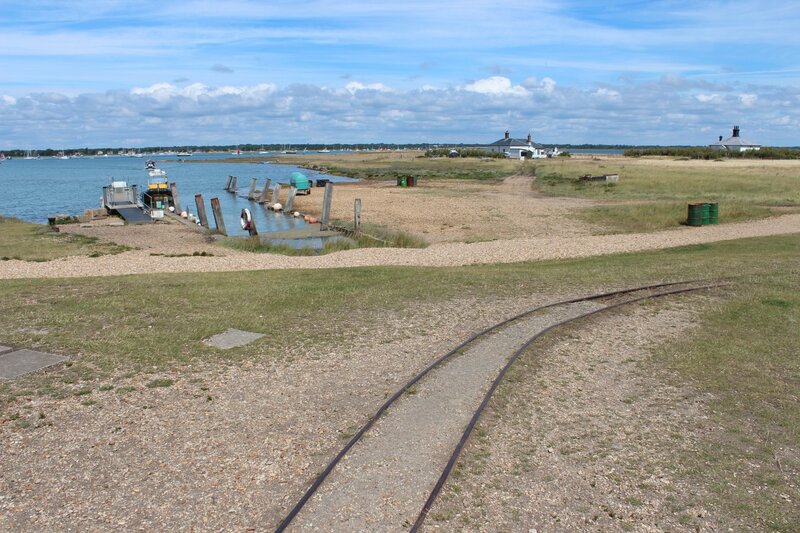 The winter storms of 1989 demonstrated the potency of these threats, rolling the spit back 80 metres over the salt marshes. 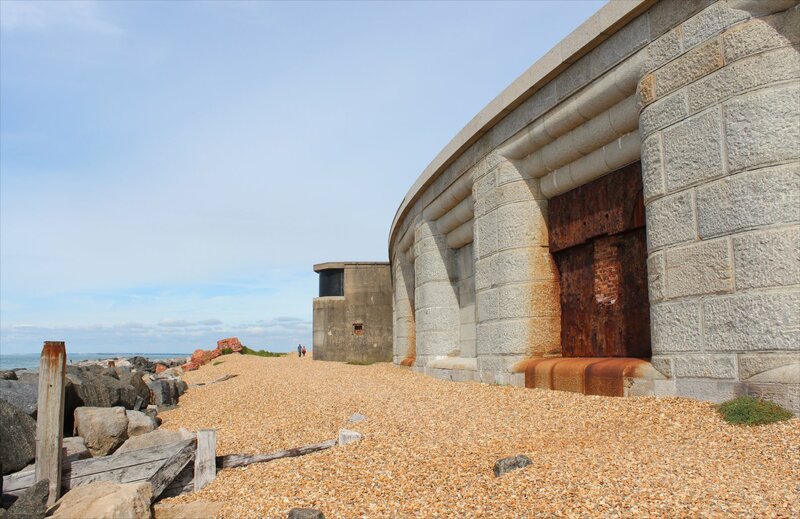 The spit was strengthened in the late 1990s in an effort to stabilise the spit, but the coastal erosion continues to threaten the future of Hurst Castle. Ultimately, the fate of the spit, the marshes and the castle are all intertwined. 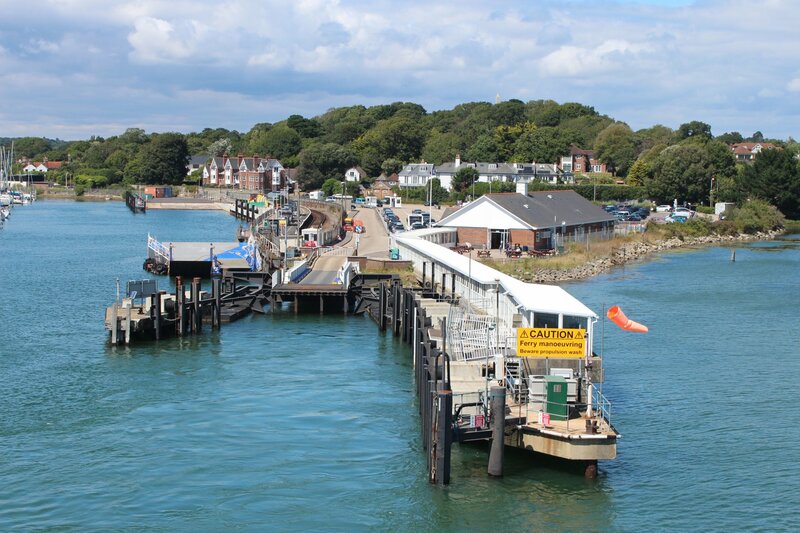 To get to Hurst Castle we took the X1 bus from Lymington High Street. 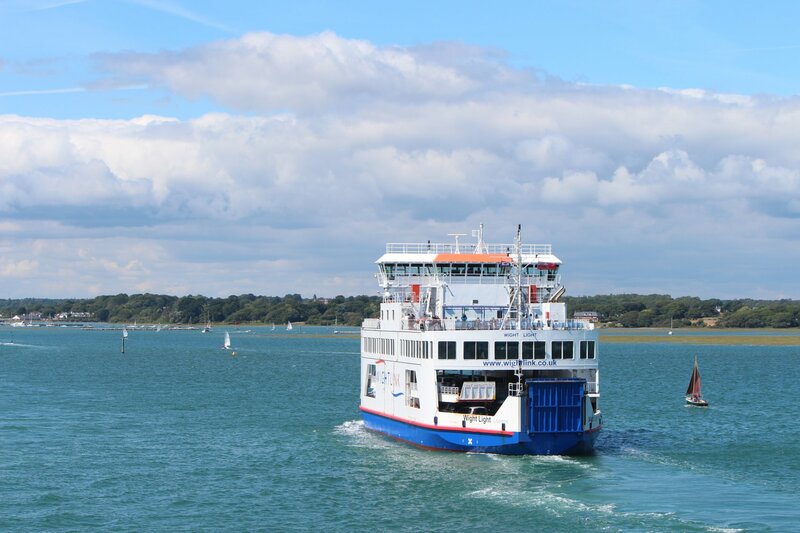 If you are attempting this trip on a Saturday, please note that the bus route is altered to avoid the street market in Lymington High Street – buses start from the stop outside the Post Office rather than in Gosport Street. The hourly bus to the bus shelter in the centre of Milford-on-Sea village takes 12 minutes and it is a 45 minute walk from this point to the castle (one mile on paved roads, followed by one and a half miles on the shingle ridge). An alternative would be to take the ferry across the marshes from Keyhaven, but this is not an option that we explored. 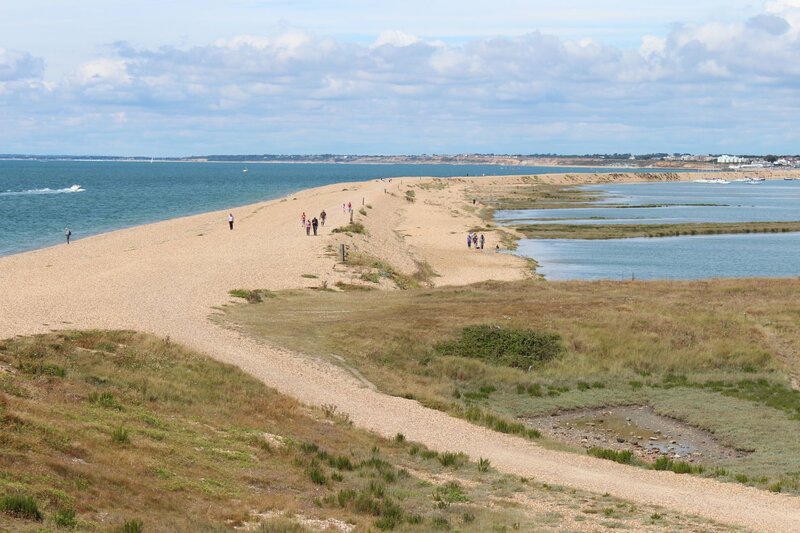 The walk along the spit offers some wonderful views of the Sturt Pond (a local nature reserve), the Keyhaven Salt Marshes, the Needles and Fort Albert (one of the Palmerston Forts on the Isle of Wight, now converted into flats). It’s worth a wander even if you do not want to visit the castle, but it does need a good day because of its exposed position – I can’t imagine it being much fun in cold, wet and windy conditions! Admission to the castle currently costs £4.70 for an adult, which is very reasonable for the amount to see inside (we spent a couple of hours, but could easily have doubled that). The guidebook on sale at the castle does a great job of explaining the buildings and the pivotal moments in the castles history. The last slam door trains on the network ran for a final time between Brockenhurst and Lymington Pier stations today, after a reprieve of just over five years. I have to admit that I have a degree of fondness for slam door stock in general, not least because my earliest memories of the railways are of seeing all blue slam door stock on commuter services at Norwood Junction. My last experience of slam door stock until today had been on the few services that remained in 2005, particularly the 17:25 Guildford services from London Bridge. Anyway, in short – it was good to be reacquainted! The final day of running for the two class 421 3-CIG slam door trains (1497 ‘Freshwater’ and 1498 ‘Farringford’) was coincidentally the hottest day of the year so far. At times the trains (1498 in the morning, 1497 in the afternoon) were packed to standing point with enthusiasts and tourists heading to Lymington to soak up the festivities. 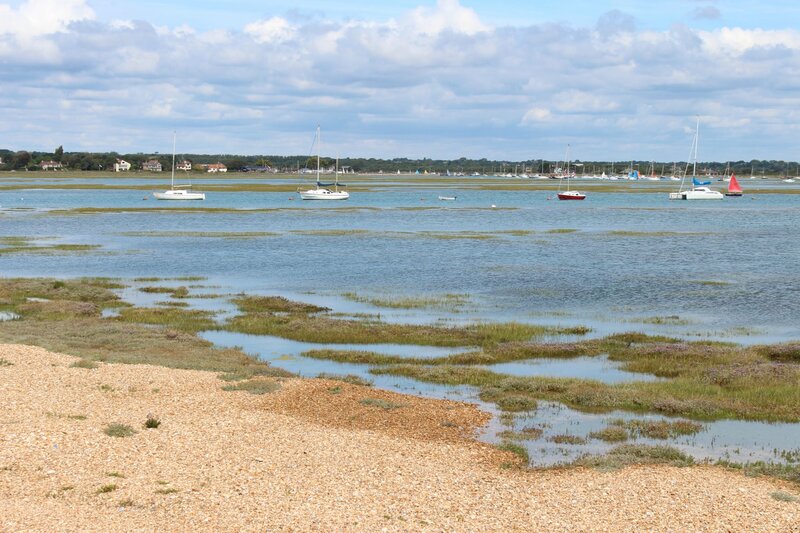 For my part, I took a morning jaunt from Brockenhurst to Lymington Pier and back, then completed a circular walk from Brockenhurst to the bridge at Shirley Holms and then back to Brockenhurst. 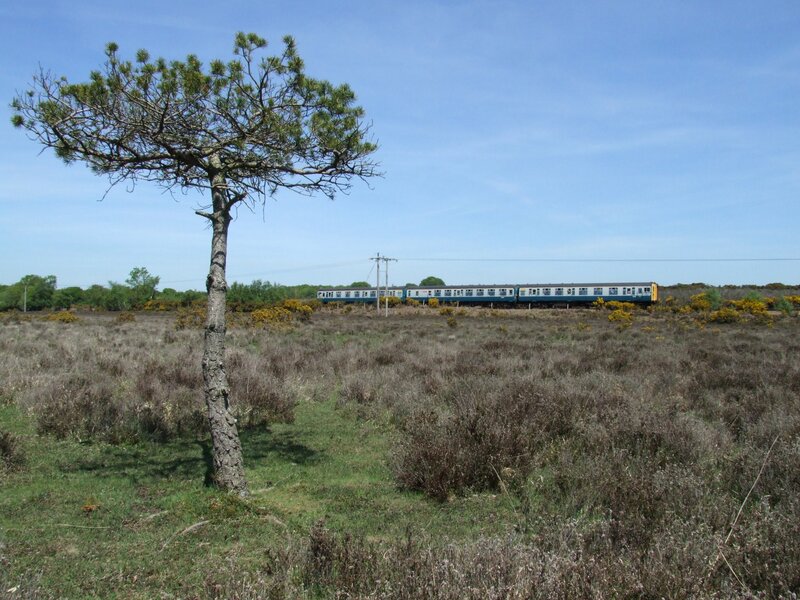 After leaving the road the walk through the New Forest National Park was a real pleasure – with some wonderful views of the line. Mr Photogenic poses... but there's no train in sight! 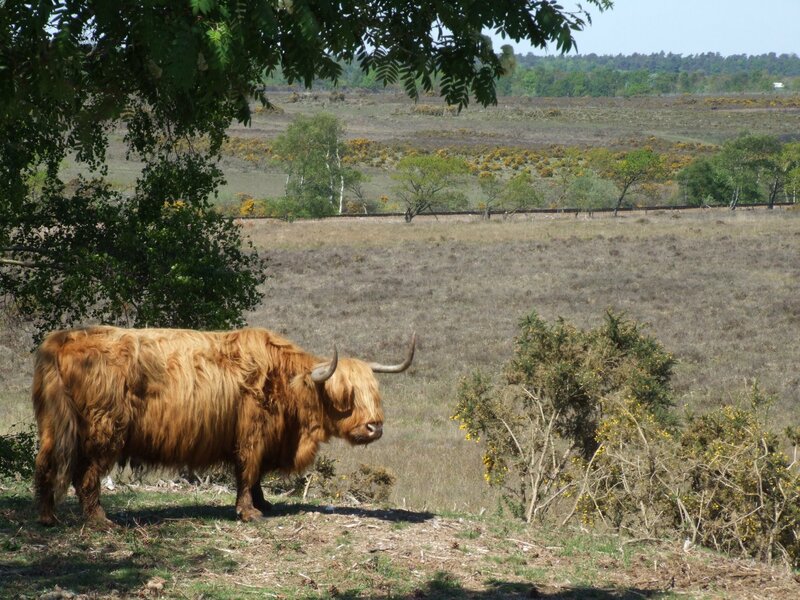 I came across some cattle on one of the hilltops (don’t ask me to be more specific than that, I’m a city boy!) with one particularly cute individual in a perfect pose. All I needed now was a slam door train to pass by… but by the time 1498 turned up my new friend had moved away. After the service passed Mr Photogenic found another good position, but once again moved before I could get a shot with a train. I have a sneaky feeling he was enjoying this… I gave up to try a less challenging (and less hairy) shot! 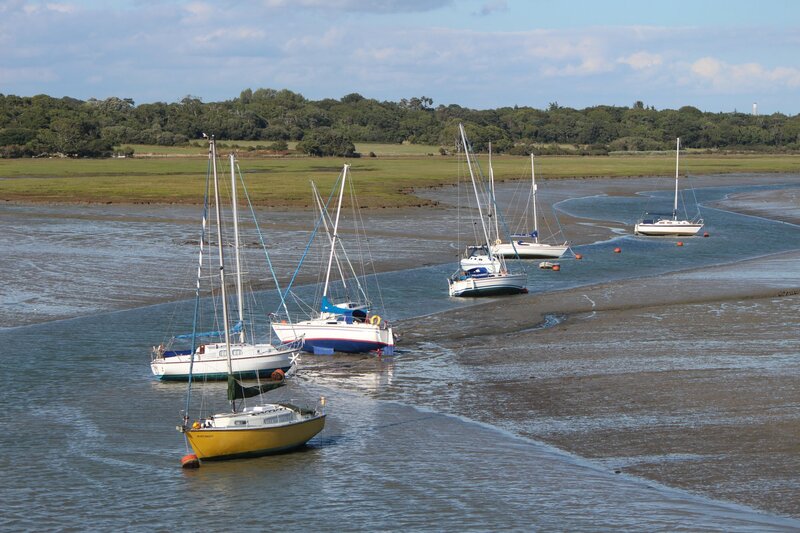 After returning to Brockenhurst I made a final return trip to Lymington Town and then headed home. All in all it had been a great day and a lovely atmosphere in which to say farewell.